Brz desert so ovosje,mini torta so biskviti i jagode.Vkusno i lesno za podgotovka.Sezona na sveze jagode treba da ja iskoristite za podgotovka na vkusni deserti. Jagodi izmijte gi i otstranete im gi drski,seckajte gi na sitni krugovi.Biskviti somelete gi,i soedinete so izmatena slatka pavlaka. Ubavo so lazica se soedinuvat sostojki. Potoa smesa so biskviti podelete ja na 3 dela,vo eden del dodajte rum,vo drug del dodajte sok,a vo tret del dodajte topena bela cokolada. 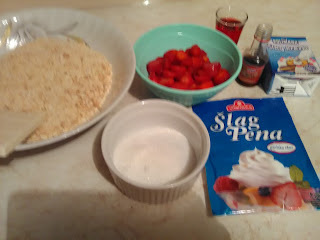 Vo soodveten sad stavete prvo od smesa so rum,redete jagodi po celata povrsina,posle smesa so sok.i pak naredete sloj so jagodi.Pokrijte so smesa od cokolada i biskviti. 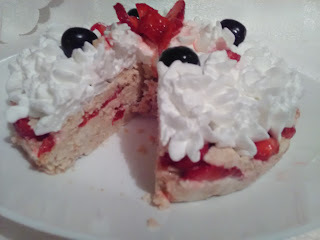 I se ostava da se ladi vo frizider da se zacvrsne.Potoa se mati slag pena so voda spored upatstvo na pakovka i se nanesuva na cela torta. Se zavrsuva so nanesuvanje na jagodi i cresi kako detalji na torta. Vkusna domasna torta za sezonsko ovosje vkus koj ce vi se dopadne. Quick dessert of fruit, mini cake with ground biscuits and strawberries.Taste and easy dessert for prepare.Fresh strawberries should make the preparations for the delicious desserts. 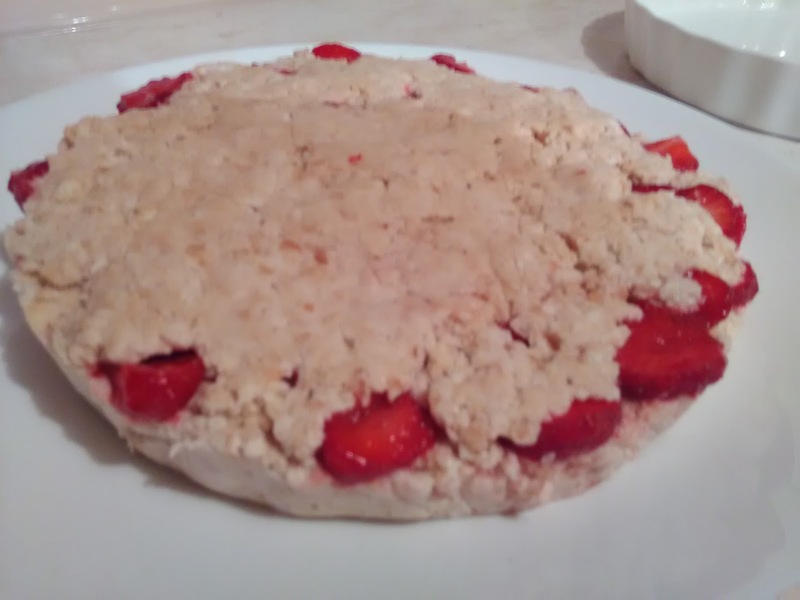 Strawberries washed cheeky remove them, cut into small circles.Biscuits ground, and unite with whipped cream. Good equalize spoon unite ingredients. Then the mixture with biscuits division into 3 parts, in one part add the rum, in another part, add the juice, and the third part add melted white chocolate. The appropriate mold put the first of mixtures with rum, strawberries makes whole surface, after mixture with juice.I again make a layer with strawberries. Cover with a mixture of chocolate and biscuits, .I leave to cool in the refrigerator until filleting cream foam.Then whisk cream foam with water as directed on bag and is applied to the entire cake and decorate. 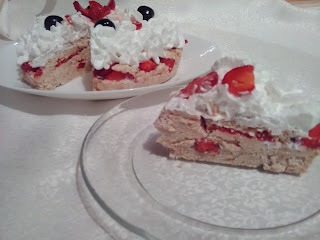 Tasty homemade fruit cake with strawberries which do not need pecenje.sluzite as a quick and easy dessert.